Archibald Davidson was born on 14 February 1878 at Hillsborough, Heathcote, New Zealand, son of Robert Bain Davidson and Sarah Jane Murfitt. On 25 April 1906 at the Glebe Presbyterian Church he married Elizabeth Innes Brebner. There were four sons and a daughter of the marriage. He died at Five Dock on 1 July 1958, aged 80 years. Elizabeth Davidson died 11 May 1940, aged 58 years. Davidson’s office and works was based at 32 Ross Street Forest Lodge where he advertised his services as an engineer, plumber, gas fitter and sheet metal worker. He moved to 45 Ingham Avenue, Five Dock in 1927 where Davidson worked as a builder. Davidson was elected in 1917 as a traditional non-Labor candidate, supported in 1914 by the Ratepayers and Property Owners Association. The 1917 Glebe Council was composed of 12 male, self-employed Protestants.The 1920 municipal election was the first occasion in which women were eligible for election to municipal or shire bodies.The first woman councillor was elected in 1928. 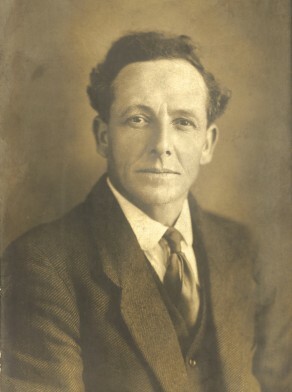 Archibald Davidson was elected at the municipal elections on 3 December 1922 but was subsequently detained in New Zealand by the seaman’s strike. This meant he was unable to take the oath of allegiance within 14 days of his election. Glebe Council called an extraordinary vacancy and a by-election held on 13 January 1923. Mayor Tate declared a ‘stranger’ in the chambers, called on Davidson to leave and he refused. Davidson was then escorted from the chambers by the caretaker and Sergeant Keenan who had been called by the mayor.